At first glance, Jim Wagner seems an odd choice for president of Emory University. Undoubtedly, he would be a good fit at Georgia Tech or Southern Poly. Or conceivably even the University of Georgia. But Emory? Emory is noted for its professional degrees in medicine, law and theology and, maybe, its liberal arts program. Wagner is an engineer. An engineer from Cleveland, no less; from Case Western Reserve University, another big engineering school; and from Johns Hopkins, with several degrees, all in engineering. So how did Wagner land at Emory, and what must he be thinking to take a job like this? 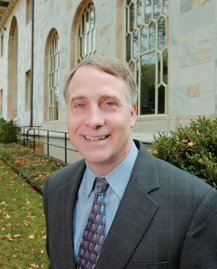 On second thought, James Wagner may be just what Emory needs: an engineer to do some restructuring and, more important, building. Maybe that’s why Ben Johnson III, chairman of Emory’s board of trustees and the search committee, plucked Wagner from among 150 applicants to take the helm. Engineer Wagner officially moved into Emory’s executive suite on Sept. 1. He succeeded William Chace, who remains on the faculty as a professor of English. Modern Emory has problems that an engineer, more than an English prof, may be best suited to solve. Emory needs a building and renovation program — not just more steel and concrete, but an image makeover and a treasury expansion. With an operating budget of $1.6 billion and 19,000 people on staff, Emory ranks third among the biggest private employers in Metro Atlanta. Emory Healthcare, the clinical component of EU, is the largest health-care system in the state. Emory has a stellar faculty and research institutions that are respected worldwide. It is home of the Jimmy Carter Presidential Center and the Winship Cancer Research Center. But the fact is that hardly anyone outside the school’s community knows much — or thinks much — about Emory, at least not in the Atlanta area and perhaps not nationwide, either. When Wagner’s parents, Bob and Bernice, moved to Stone Mountain nearly 30 years ago, the new president said he came for a visit and regarded Emory as a regional institutional without much national identity. He hopes to change that perception in the near future. That may be a difficult goal. For starters, Emory’s student body and, therefore, its alumni are not rooted in Atlanta or Georgia. More than 60 percent of Emory’s 11,600-member student body comes from outside the Southeast. New England and the Middle Atlantic states account for one-third of Emory’s enrollment. Why Not A College Town? Still, Wagner wonders why Atlanta is not more like Boston, where both the city and higher education are mentioned in the same breath. In a recent address to the executive committee of the Commerce Club, Wagner noted that, perhaps surprisingly, a recent study ranked Atlanta as a leading hub of higher education. So why aren’t Emory, Georgia Tech, Georgia State University, the Atlanta University Complex, Oglethorpe, et al. emphasized in most pitches about the importance of Atlanta? Wagner doesn’t know, but he hopes to make certain that Emory — and, of course, Atlanta — are emphasized as “education destinations” in the future. The new president seems particularly comfortable with Emory’s partnership with Georgia Tech, and he hopes to improve that relationship even more in the coming years. The major reason: attracting more research dollars for both institutions. Wagner comes to Emory with a national reputation for being a hound for federal research dollars. And Emory, like Tech, looks to the government for big bucks. Two years ago, Emory ranked 30th among universities in attracting federal grants, as it garnered more than $170 million. Tech came in at No. 42 with $144 million. The state of Georgia also contributes significant sums to Emory, most recently $5.2 million from the Georgia Cancer Coalition for distinguished scholars and clinicians. However, private endowments are largely responsible for Emory’s national stature. Thanks to the Woodruffs and other corporate donors, Emory has received more large contributions than almost any other higher-ed institution, except Harvard. In recent years — partly because of an economic recession and partly because of some unsavory academic publicity — corporate contributions are down. Emory alumni don’t donate in great numbers. Only about one-third of Emory’s old grads write checks, compared to say, Princeton, where more than 65 percent contribute. Experts say that low alumni participation may indicate Emory was not a first-choice school among many of its students. Wagner says he hopes to change that perception. So even with all the talk of image-building and creating fame for Emory, Wagner’s central task is raising cash. In the coming months, he is expected to mount a major capital campaign, the goal of which has not been established. He’ll be competing head-on with other schools in the state and region, which also are ready to launch major campaigns as the economy shows signs of rebounding. But for now, engineer Wagner is taking his measure of the Atlanta and Georgia terrain and deciding where to build his first bridge to the future for one of the best, yet least known, academic institutions in the nation. A couple of other things: Though Emory is connected to the United Methodist Church, Dr. Wagner is a Presbyterian. He said he broke with the Methodists some years ago in a dispute involving the appointment of a pastor, the details of which he declines to discuss. Besides, religion doesn’t seem to matter much. Emory’s faculty and students come from nearly every faith imaginable, with 15 percent of enrollment being Jewish. At age 50, Wagner, who is married and has two daughters, might appear to be a youngster among presidents of major universities, but not by Emory’s standards. Warren Candler became president of Emory in 1888 when he was only 31. In more recent times, Emory’s best-known president, former ambassador to South Korea Jim Laney, was picked at 49 to head the school.